Received her degree at the University of Nebraska and later studied at the Chicago Art Institute. She was skilled in both painting and sculpture, but after her marriage did not produce artwork for many years. She traveled extensively, particularly in the Orient, and collected Japanese prints. She took up painting again in the late 1920’s and on a return visit to the University of Nebraska around 1932, became involved in a project to do a sculpted portrait-relief of Dean Riese to be installed in Riese Hall. 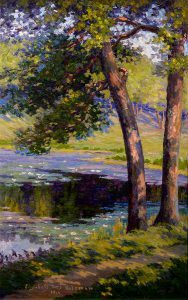 The work was a success and while she continued to be a wife and mother, she began taking many commissions for both paintings and sculptures.